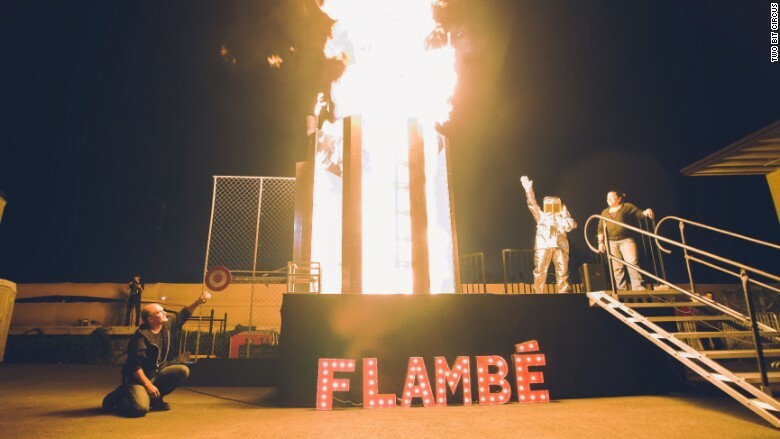 The STEAM Carnival's popular Dunk Tank Flambé submerges people in flames instead of water. Just outside a cavernous pier in San Francisco, someone wearing a full-body suit stands inside a glass tank and calmly waits to be set on fire. The setup looks like a classic "dunk tank," complete with a pile of balls near a big target. But instead of dropping a clown into cold water, a hit unleashes a torrent of flames on the person in the fire-retardant suit (who may or may not also be a clown, depending on the shift). Don't worry. It's all for the kids. Called "Dunk Tank Flambé," the game is part of STEAM Carnival, a new traveling event that combines high-tech games, virtual reality, hands-on science and a bit of danger. The show is designed to get children excited about learning science, technology, engineering, arts, and math (yep, STEAM). 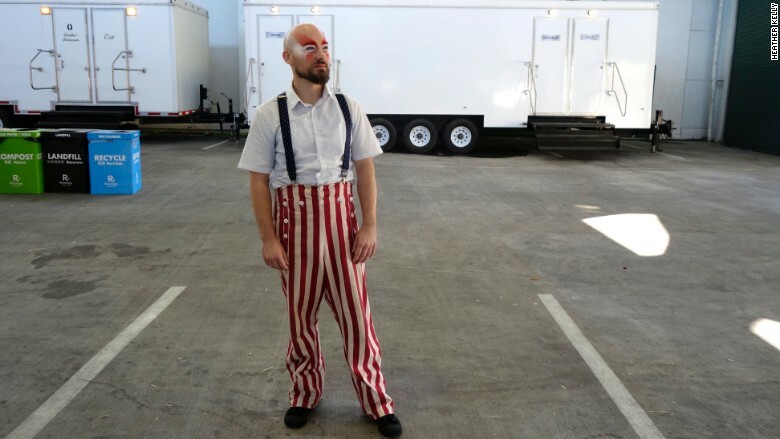 "This is an opportunity to rebrand what it means to be a nerd," said Brent Bushnell, cofounder of Two Bit Circus, which puts on the carnival. "We like lasers, fire and robots. That's a lot more fun." The three-day event in San Francisco is the second STEAM Carnival. Organizers hope it's the start of a new kind of traveling festival. In the spring, the show is going on the road, with a cross-country tour hitting Seattle, Charlotte, Chicago and Dallas. 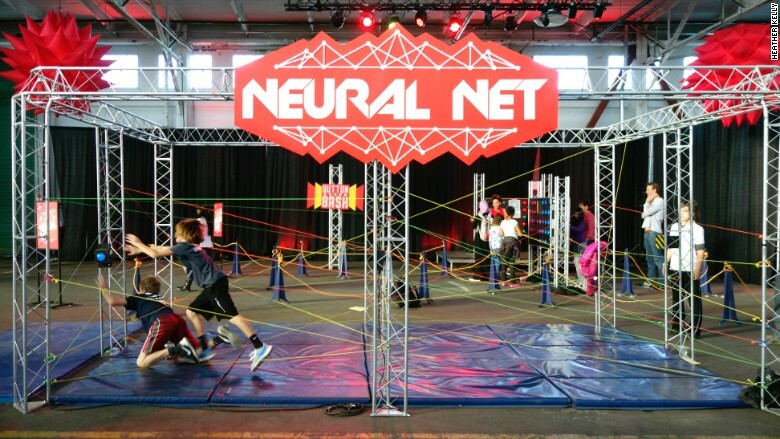 Children race through the Neural Net game at the STEAM Carnival in San Francisco. Aimed at kids aged 8 to 16, the carnival has obstacle-course-like games, workshops on prototyping, and a Tesla coil performance by Dr. MegaVolt. Anyone can try walking a tightrope or racing motorized tricycles around a hay-bale track. The carnival is similar to Maker Faire and US FIRST's robotics events, but with a more entry-level vibe. Each section is designed to be educational, but fun and socializing clearly come first. Two Bit Circus is a Los Angeles-based production company that creates elaborate "experiences" for events and companies. It's made virtual reality videos for sports companies and created the Rube Goldberg machine in OK Go's viral video, "This Too Shall Pass." In October, it raised $6.5 million in funding. Many of the installations were originally created for clients and then adapted for the carnival. In the virtual reality area, kids and adults can put on Gear VR goggles and feel what it's like to go 175 miles-per-hour in a race car -- a project originally created for Verizon (VZ). Whimsy and games are in Bushnell's blood. His father, Nolan Bushnell, founded Atari and Chuck E. Cheese. Now the younger Bushnell runs Two Bit with his mohawked partner Eric Gradman, a competitive whistler and former circus performer. A perfomer at the STEAM Circus watches a tighrope act inside San Francisco's Pier 48. The company hopes to capitalize on the Maker resurgence and hopefully inspire the next generation of inventors. That first inventive spark often comes from doing something you feel like you're not supposed to do, says Bushnell. At the STEAM Carnival, the kids making a mess with non-Newtonian fluids or shrieking at the top of their lungs in the Scream Chamber might leave with a new interest in science or art. Or they might just get a sore throat and some good memories. That's cool too.